You’re supposed to take it out of the fish after you’ve smuggled it in the port. Photo courtesy of David English. Commonly found in Chinese restaurants in Amsterdam as well. Have you got any fish crank? Also available: Huang He LSD duck and Hanjiang heroin beef. We’ve got pike for your pipe and sole for your bowl. 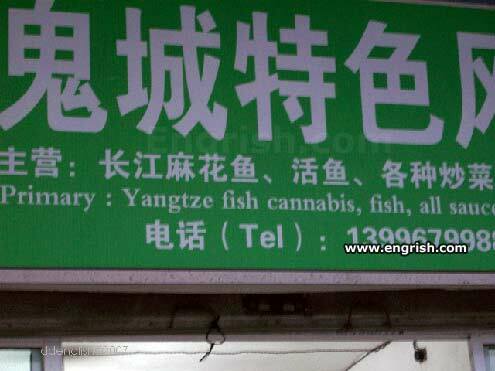 Fish Cannabis. Gateway to the oceanic opiates. Ok, literally, 麻花 means “hemp flower”. It also just so happens to mean fried dough twists. Flying fish always get high. Wow! My fins are like gossamer wings. I can fly! I CAN FLY! And the dugong sings in the dawn’s purple light. Put that in you pike and smoke it! For people who like their fish stoned rather than battered. A lot of people are more hungry after eating here. Strange that there isn’t engrish text mentioning the ghost town referenced in the large line of text on the top. Sir, do you want your fish served in a pot? @Lora: Thats why you feel hungry again a half hour after eating Chinese. “Demon area with specially coloured nets. That’s what happens when you stupidly translate the characters one by one. This probably was submitted by Goliath Engrish and not David English. Are you sure you got the spelling right…. Secondary: Yangtze Pork Pot, pork, some sauce. Let us joinT together for this feast! Fish cannibis???? Can I get mine smoked? ?